The role of elders in our ministry is to provide leadership, government, spiritual discernment and discipline. They have responsibilities for the life of our congregation, as well as the whole church. Accordingly, at First Presbyterian, the elders serve as leaders of four specific teams: Ministry Support/Building and Grounds, Mission/Outreach, Worship/Spiritual Formation, and Community Life/Nurturing. They serve on the Session and may also be elected to higher councils (Presbytery, Synod, General Assembly of the church). Sherrie has experienced a variety of church involvement, but she settled upon First Presbyterian when relocating to Silver City in 1999. She currently serves in the areas of Worship/Spiritual Formation with a heart for children, mission, theology and health ministry. She is a full-time pediatric occupational therapist and the mother of two adult children. 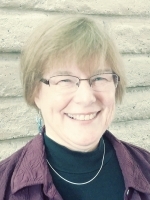 Barbara is a retired music educator, singer and choir director. She and her husband retired to Silver City from Minnesota in 2002 and established a local affiliate of Dolly Parton’s Imagination Library, whose mission is to improve the educational success of Grant County students. Anne, a native New Mexican, has experienced a range of volunteer and paid work including church musician and teacher, accompanist for choral and instrumental students, ESL tutor, and Girl Scout troop leader. She is currently the clerk of our Session, as well as church pianist/organist. She will happily talk about Protestant hymnody at any time. Sunny is a retired hospital administrator who specialized in strategic planning, marketing and public relations, talents she is now trying to share with our First Presbyterian Church. She volunteers for organizations that help feed the hungry. She lives in Silver City with her youngest son, Dan Spurgeon, who works with the developmentally disabled. 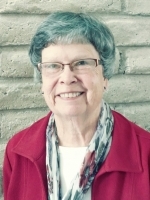 Ruth, a life-long Presbyterian, enjoyed a career in the telephone industry before retiring and moving to New Mexico, where she directed a small non-profit organization. Church work claims her heart and she enjoys providing Bible studies to children and adults, occasionally preaching a sermon, and serving wherever she’s needed. If you have a prayer request, either fill out the message area on our Contact Us page or call Susan Tester, our church secretary, between the hours of 9 a.m. to noon and 1 p.m. to 4 p.m., Tuesdays through Fridays, and Susan will get your request to the wonderful people who comprise our Prayer Chain.